The National Safety Council’s (NSC) mission is safety at work, at home, and on the roads. In June, NSC and organizations across the country work to raise awareness of safety issues because staying safe isn’t an accident. Here at Red River we focus on safety daily, not just one month out of the year. The Bureau of Labor Statistics reported that there were almost 3.2 million nonfatal workplace accidents by private industry employees in 2014. Keeping all of our employees safe is of prime importance. It’s a job we take very seriously. To do this we have safety measures in place and procedures employees must follow when working. The machining equipment and waterjet cutting machines can be dangerous if not used properly. Safety measures for machine operators include simple procedures like wearing safety glasses at all times when on the shop floor. We also encourage that machine operators to not wear loose clothing, rings, watches, jewelry, or anything that can get caught in the machines. Sturdy shoes are also considered part of the proper attire. For material handling personnel we require all forklift drivers to attend training classes on proper forklift procedures. Many accidents are caused by improper training of operators of forklift trucks. Because of our training requirements we have prevented many workplace accidents. We also work with our employees on proper lifting and ergonomic techniques to prevent back injuries. Workplace cleanliness and organization also falls into the safety category. Putting tools back when finished and keeping walkways and workstations clear helps keep others from falling or getting hurt. Staying safe also means watching out for each other to prevent hazardous situations. Workplace injuries are the leading cause of lost work time. But, lost work time is secondary to the value we place on keeping each employee out of harm’s way. Preventing accidents is the best way to stay safe and following set safety procedures is the best way to do that! 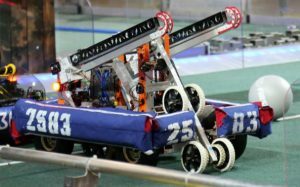 We were extremely excited to be asked to help a local team build their robot to compete in FRC. We provided some water jet work they needed on 1 x 2 aluminum tubing. Their robot #2583 is impressive—big, orange and blue, with hooks that can grab onto things. A competition like this is exciting in so many ways. It builds teamwork and develops skills that will carry these students into careers like engineering or manufacturing. We are thrilled to be supporting the next generation of engineers and the school programs that are developing talent in the technology fields. 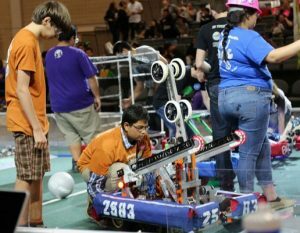 Red River is proud of the job they did and looks forward to continuing to offer support and guidance as students continue to compete and explore engineering. Precision manufacturing wouldn’t be precise if it couldn’t produce consistently reliable and accurate parts. At Red River, we put precision in our name because we have the capabilities to manufacture outstanding components for any industry, no matter the material or the complexity. Our goal is to produce high-quality American made products, and we meet this goal on every project. As a full-service metal and manufacturing company, we work with a wide variety of materials, including aluminum, steel, stainless steel, titanium, copper, alloys, and much more. Our Punch Press can handle the material thickness of 10 ga mild steel, 14 ga stainless steel, and 3/16 in. aluminum. Press brake capabilities can handle parts up to 12 ft long and has a maximum of 125 tons. We meet the needs of the precision industries we work with by providing them with fabricated parts that meet the tight tolerances specified. We routinely work to tolerances as little as ±0.005 in. Red River Precision Manufacturing lives up to its name. Our customers rely on us for full fabrication services of high-quality components at competitive prices. If you need turn-key fabrication of prototypes, short runs, or volume production, Red River delivers precision every time. Clean energy is a broad term for less polluting energy sources, which include large scale energy supplying sources such as wind, solar, hydroelectric, and geothermal but also smaller energy reducing products such as LED light bulbs and electric cars. The clean energy movement is taking shape across the U.S. as Americans are looking for ways to reduce energy, greenhouse gas emissions, and dependence on fossil fuels. Even though the recent Supreme Court decision ruled to put the EPA’s Clean Power Plan regulations on hold, the clean energy movement is well underway and gaining speed. Cities across the country are signing on for new solar energy programs and residential solar is continuing to grow. Wind energy has found a greater footing in Europe than in the U.S. but projects are continuing on land and in the sea to build viable wind farms. The most amazing part of this clean energy boom is that it is often supported by local utilities. The end game is to cut greenhouse gasses but finding renewable energy sources that are reliable, effective, and efficient are also a major benefit. With the growth of the clean energy industry, we recognize the needs the industry will face as it continues to expand. Precision metal forming will be required to continue to build the solar panels, wind turbines, and specialized components that will deliver electricity to more homes in more diversified areas. Red River Precision Manufacturing has the capabilities needed to handle the challenging requirements of the clean energy industry. As the energy industry continues to move into cleaner sources, the bending, cutting, and machining services provided by Red River Precision Manufacturing will continue to be sought after. To learn more about how our metal fabrication services can meet the needs of the clean energy industry, as well as any other industry, please feel free to contact us. There is no question that technology is advancing fastermanufacturing semiconductors each year. Cell phones, tablets, smart devices, all have had rapid advances. Morre’s Law predicts that computing power doubles every eighteen months. That means that more and more semiconductors will be needed and semiconductor manufacturing will have to meet this increase in demand. Red River Precision is up for this challenge and dedicated to producing quality American-made products. For those outside the industry, it often seems like not much ever changes with manufacturing. Raw goods go in, and finished goods come out. But, for those of us involved in the day-to-day aspects of the industry, we see how new technologies are having an impact on today’s processes. With the coming of the new year, there is always anticipation and excitement about what changes may take place in the next 12 months. Surveys are completed regarding industry trends and how manufacturers will be working over the coming year. A new report by Citrix examined technology trends in manufacturing and found that most manufacturers are embracing some new technologies but the tried and true methods are still the mainstays of their business. In 2016, the industry is predicted to embrace next generation materials for 3D printing and utilizing this process to design and manufacture more personalized products. Aluminum costs are dropping and the material is finding new applications in many industries (the Ford F-150, for example). Robots and high-tech manufacturing are also hot topics as connectivity and technology join forces with traditional methods. Although the experts often point out the newest technologies as coming trends, we see the trends in combining the traditional manufacturing processes with the technology to improve their function. For instance, computer and software driven water jet cutting equipment handle both metal and non-metal materials and eliminates the secondary operations to obtain smooth, finished edges while improving on accuracy and efficiency. While predicting the future is commonplace at this time of year, many of those predictions are not yet viable in today’s manufacturing environments to improve upon the processes currently in use. The technologies that do make it are the ones that allow us to improve processes and reduce costs for our customers. At Red River, those are the trends we will be embracing. That’s one of the main advantages of working with a small business like Red River Precision: You get more personalized service. You matter. And there are other advantages, too, like having the opportunity to easily make changes and customize a product or service when you work with a small business, like us. At Red River Precision Manufacturing, we are proud to be a small business providing sheet metal fabrication from our 12,500-square-foot facility in Texas. We pay attention to our customers. We build relationships and get to know our customers’ needs, and we provide the best solutions that fit each customer’s budget, whether that budget or the project itself, is big or small. We’ve made it our company’s mission to provide our customers with high-quality American-made products, On-time, and on-budget, from prototypes to short runs and volume production. We may be a small business, but we do provide big advantages — and even bigger value — to every one of our customers. And we plan on doing the same for many more years to come. We invite you to experience these advantages by working with us in 2016 and beyond, and we hope to hear from you soon! These numbers are big, and they may seem “overwhelming” or “crazy” to anyone not familiar and experienced working with the semiconductor industry. But, as a full-service custom manufacturer of metal prototypes and products, Red River Precision has worked with several companies from the semiconductor industry. Our experience refurbishing equipment and components for the semiconductor industry has had us manufacturing new parts or replacement parts to vamp up machines and bring them to newer standards. Working with the “crazy” semiconductor industry is something that we enjoy doing here at Red River Precision, and we welcome the opportunity, every chance we get! Drive home the importance of this activity to the prosperity of the nation. Show them exactly how financially lucrative, respectable, rewarding and advanced a career in manufacturing and production can be. This is accomplished through educational events, factory and plant tours and open question-answer sessions with industry influencers who not only orient the students but also their parents so that choosing manufacturing emerges as a viable alternative for many. WHERE DOES RED RIVER FIGURE? Red River Precision Manufacturing Inc. is an industry leader where providing manufacturing critical services like shearing, punching, water-jetting, drilling and forming are concerned. During Manufacturing Day reflect about the past and welcome the future of manufacturing. We encourage any interested young students pursuing manufacturing to go for it. Red River Precision is proud to carry the baton in favor of a bright future of manufacturing in the US. To know more about Manufacturing Day and how people are celebrating around the country visit. 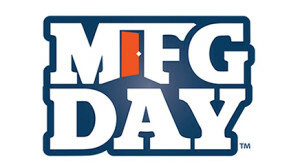 http://www.mfgday.com.